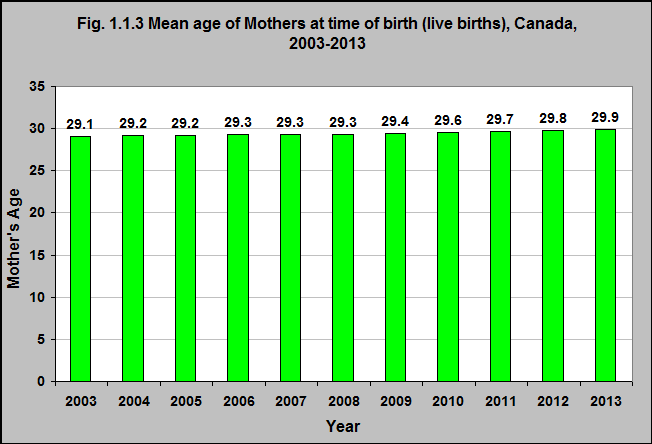 Source: CICH graphic created using data adapted from Statistics Canada, Table 102-4504, Mean age of mother at time of delivery (live births), Canada, provinces and territories, annual (years). http://www5.statcan.gc.ca/cansim/a26?lang=eng&retrLang=eng&id=1024504&&pattern=&stByVal=1&p1=1&p2=38&tabMode=dataTable&csid= -accessed March 15, 2017. The mean age* of mothers when they give birth is increasing. *Mean age of a mother for Canada, a province or a territory is calculated by summing the mothers’ ages at their last birthday preceding delivery and then dividing the sum by the total number of live births in that jurisdiction. To estimate mid-year mean age, a statistic often used in analyses, add 0.5 to the mean age. 1Statistics Canada, Table 102-4504, Mean age of mother at time of delivery (live births), Canada, provinces and territories, annual (years). http://www5.statcan.gc.ca/cansim/a26?lang=eng&retrLang=eng&id=1024504&&pattern=&stByVal=1&p1=1&p2=38&tabMode=dataTable&csid=-accessed March 15, 2017. For most Canadians, the most intensive period of child rearing – raising young children – takes place when they are in their thirties. The result is that many more children are likely to live in families where one or both parents have more secure employment and relatively higher incomes than children of younger parents.